The new Bark River Cub proved itself last week on a Mississippi deer hunt. The knife was worked hard, under challenging field conditions and proved to be a blade you can depend on. 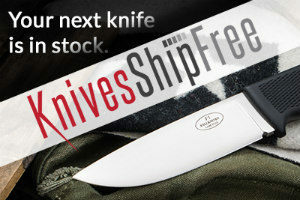 Knivesshipfree.com is a Survivalcommonsense sponsor. I did not get free products to do this review, and was not paid to write it. This is my opinion. 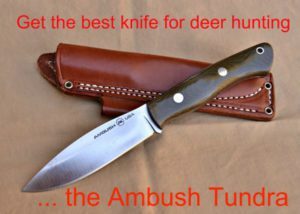 Neither KSF, Bark River Knives, Jenna Martin nor Vehement Knives had any input into this review. The whitetail doe ran about 100 yards after I squeezed the trigger, despite the shot that pulverized her heart and lungs. She ran onto a muddy field before collapsing. I walked up on the dead animal, and paused a moment to be thankful, as I always do. When I was over initial moments of awe, thankfulness, respect, and a tinge of regret, reality hit. It was raining, the field was muddy, and I was a good mile from the road. I was hunting alone, and there was no one to help get the deer out. I tried dragging her, and got about 10 feet before the mud balled up on my feet stopped me in my tracks. The carcass would have to be reduced to a manageable weight. Tools for the job consisted of my Bark River Cub, a blue plastic tarp and 25 feet of paracord . I quickly gutted and removed the lower legs and head. Then I rigged up a drag using the tarp and paracord. Now a more manageable weight, I could drag the carcass out of the field and to a place where I could skin and quarter it. The ribcage meat was boned out, and put in gallon plastic bags, and the quarters were placed in a couple of breathable culinary bags that 50 pounds of rice originally came in. With the weight now reduced by about half, I could make the long 3/4-mile drag to the road. You couldn’t pay me to work this hard, but wild horses couldn’t keep me from re-playing this scenario at the next opportunity! The Cub’s handle never got slippery, even when covered with blood. 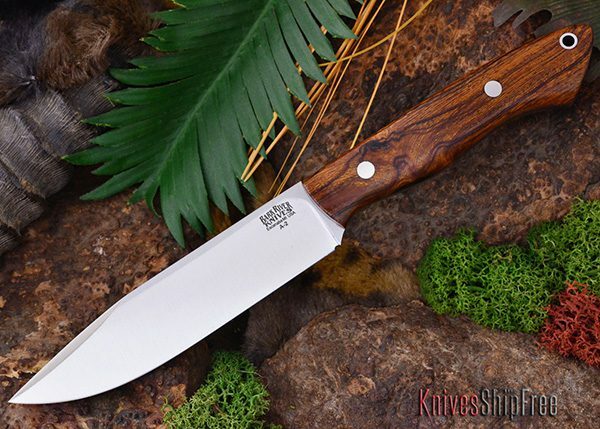 When the original Bark River Grizzly Bowie came out, I loved the Moran-style handle and design, but couldn’t see me carrying a Bowie as a user knife. But the Cub’s handle was the first attraction for me. It looked big, comfortable, and appropriate for a user knife. After I got mine, I did a preliminary review, using the knife for various bushcrafting tasks, such as whittling firesticks and carving wiener sticks. It worked just fine. 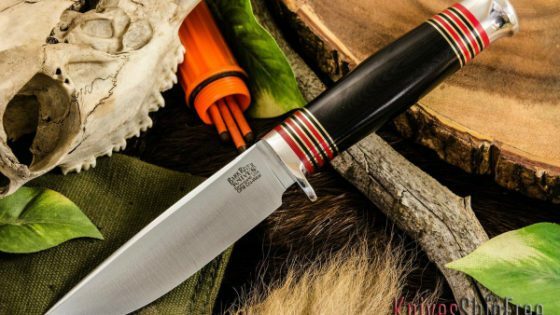 But I expect my hunting knife to double as a survival knife if need be – after all, I am most likely to get into trouble when I’m out hunting, far away from others. 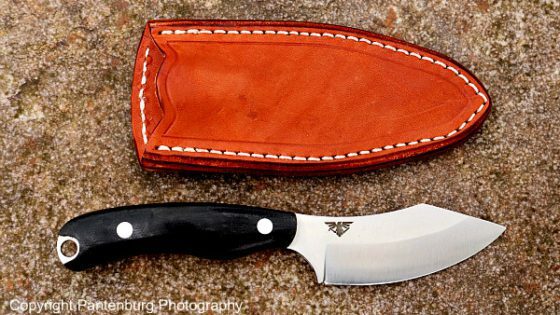 That knife needs to be lightweight, easy to pack and comfortable to carry. Above all, it needs bullet-proof durability. The Cub is lightweight and compact, making it easy to carry. 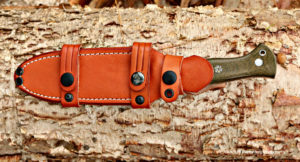 High-Quality Ambidextrous Leather Sheath Included. Handle design: The design makes this knife a pleasure to handle and use. At one point during field dressing the doe, I had to dip my hand and the Cub into the bloody slurry from the pulverized heart and lungs to cut the esophagus. The handle never got slippery or dangerous to handle with my bare hands, despite being covered with the bloody goo. The micarta seemed to get “grippier” and tacky. Full length tang: This is a necessity for a survival knife, IMHO. A full tang is the strongest possible handle option. 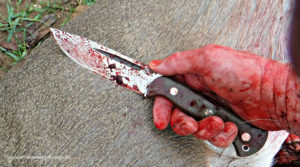 Blade length: My favorite blade length for a deer hunting knife is between four and five inches. The Cub’s 5.25-inch blade is a good length – it is long enough to split ribcages and nimble enough to work inside the abdominal cavity. Point: A clip point with a long swedge is my favorite. The point is thin enough to do the initial under-the-tail knife work, and skin around the neck and front shoulders. There is enough belly in the blade to make it a good skinner. Grind: The Cub’s convex is my favorite grind. In a side-by-side test on a bull elk, I tried convex, Scandi and flat grinds for skinning. Convex came out the clear winner. You can’t beat convex for a hunting/bushcraft knife. Spine: The spine is ground to a 90-degree angle like an ice skate and has jimping in the area where my thumb is placed. This grind will work well for scraping a ferro rod, shredding tinder or processing pitchwood. 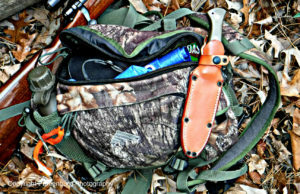 The Cub’s sheath is a very secure, comfortable way to safely carry the knife. Steel: CPM 3V is one of my favorite steels and I have used it extensively. In this case, I used the Cub to gut the doe and split the ribcage, cut off all the legs at the knee joint, and remove the head. After all the work the cub did on the doe, it was still scary sharp. It could have easily field dressed another deer or elk without sharpening. 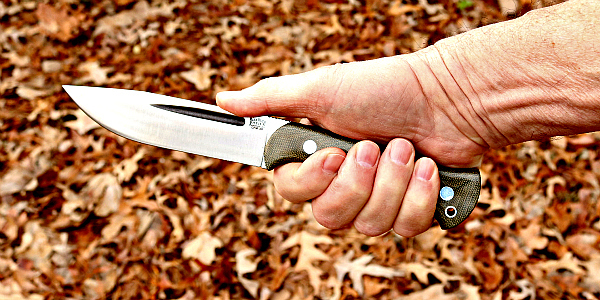 Sheath: This sturdy leather sheath is so good, it got its own review. But basically, this is the best sheath design I’ve come across in a long while, and it’s worth looking at. As soon as they come on the market, I’ll be getting some for other knives. Do you need a Cub? 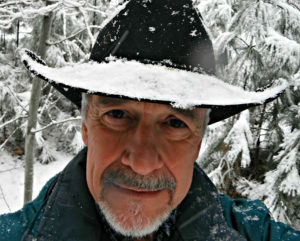 The true test of any survival/utility/hunting knife is in the field, and the Cub has proven itself to my satisfaction. I wouldn’t have any concerns about using this as my main knife in the western backcountry or far off the road in the southern swamps. 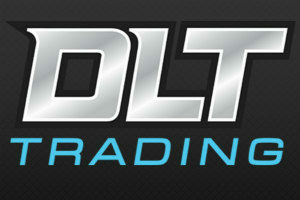 If you are looking for a reliable, dependable hunting/survival knife, you don’t have to look any further. (You can buy one here.) The Cub may be your best choice and it will serve you well. It’s a great all-around knife! Just ordered a cub after reading and watching several reviews on this knife. 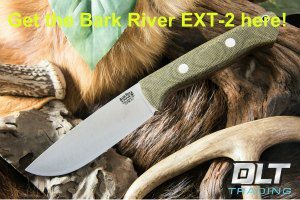 I can’t wait – my first Bark River knife!!!!! 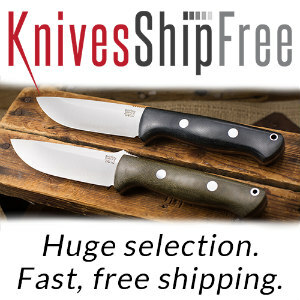 I have field tested several dozen Bark River knives, and have been extremely satisfied with how they work. I’d suggest you use the knife some before making your final judgement. I recently picked up my 1st Bark River knife. It is the Bowie Vest knife. If this is an example of Bark River’s knives, I will never order another one. Extremely light, too light! Just doesn’t feel right and almost falls out of my hand, poor balance! Can’t imagine that the edge will last based on the weight! Love Dozier and will purchase them or another MS custom instead! !